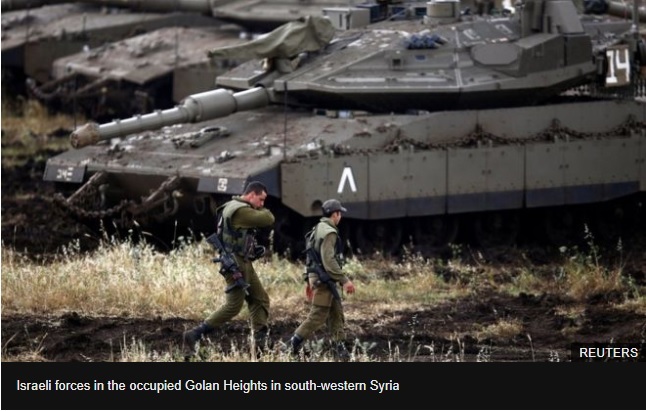 Israel says its forces have struck almost all of Iran's infrastructure in Syria, in response to an Iranian rocket attack on the occupied Golan Heights. The Israeli military said 20 rockets were fired by Iranian Revolutionary Guards at its positions overnight. It retaliated by targeting what it said were Iranian weapons depots, logistics sites and intelligence centres. There was no immediate comment from Iran, which has sent troops to Syria to support President Bashar al-Assad. Syrian state media reported that the army's air defences had repelled an "Israeli aggression" on Syrian territory, shooting down scores of missiles. But a military source told the official Sana news agency that some missiles had hit a number of air defence battalions, radars and an ammunition depot. Israel's government has vowed to stop what it considers its arch-enemy's "military entrenchment" in Syria, and it is believed to have carried out several strikes on Iranian facilities since February. It had been anticipating a retaliatory attack by Iran or its proxies in Syria since seven Revolutionary Guards personnel were killed in a strike on an airbase in April.